In Magic the Gathering, the decks are required to be no less than 60 cards, but can be larger. Since you can only have 4 of each card (except for basic lands), it seems you would want the limit size to improve your chances of getting the cards you want. Why would you want to play with a larger deck? You can easily run yourself out of cards if you build a standard-sized deck based around card-drawing, decking mechanics (where you try and exhaust your opponent's deck), or graveyard-pilfering (where you want to get as much stuff into your graveyard as possible). This can quickly happen if you play with Recycle, Worry Beads, Anvil of Bogardan, Riptide Director, Tolarian Serpent, Cephalid Vandal, Prosperity, Ambassador Laquatus... or any of the infinite card drawing combos. These are some of my favourite kinds of decks for casual play, and are routinely large. A third reason is if you want to keep your deck general, and include lots of options for dealing with different types of enemies. You can build powerful decks around this approach, using the idea of cycling, digging or searching through your deck with e.g. Tutors, Skyship Weatherlight, Captain Sisay, and so on, to find the exact card you need for any situation. From a strategy standpoint, my answer would be "You wouldn't". The mathematics of probability in drawing from a 60 card deck vs a 61 or 62 card deck change (almost dramatically). Here's an interesting article. However, I think that often you can start with more than 60 cards when 'testing' a deck. Often you find that a card doesn't fit or 'play nice with others' and should come out. Same with cards that you draw and think "I wish I hadn't drawn that". Those cards come out also. So to summarize, when testing ideas, 60+ is okay. For tournament play, reduce to 60. You might be playing in a format that mandates it. One example is Commander, which uses a deck of precisely 100 cards, with no cards repeated save basic land. Effective Magic decks thrive on consistency. Exceeding the minimum deck size is only worth it if it gives you a powerful benefit you can't gain otherwise, like a surprising way to attack the metagame. Pushing your deck above 60 (or 40) cards makes it harder to find key cards, increases the risk of "mana flood" (drawing only lands, so you have nothing to cast) and "mana screw" (drawing too few lands, so you can't cast any of the spells in your hand), and makes it more likely that you'll draw unplayable hands. Generally speaking, this is not a good plan! Even in a casual environment where playing an optimal deck might not be your top priority, losing because of flood/screw or bad mulligans isn't fun. Running a 61st card to add “half a land” to your deck is almost always wrong. If you really need to add half a land, then cut an expensive spell and add a cheap cantrip. Specific combo-style win conditions can justify going over the minimum number of cards. Examples are Battle of Wits (which requires a huge library to win the game) and Scapeshift (which requires playing enough Mountains to one-shot your opponent with Valakut triggers). However, since increasing deck size hampers your ability to actually find your key cards, it seems that it's only worth it for one-card combo kills — and you should play lots of tutoring and filtering cards so you can find them faster. Very rarely, it'll be a good move to play a deck that has no win condition other than just letting your opponents run out of cards in their library. This is for lockdown archetypes like Fog and Stasis. It's good to be aware of these archetypes because they sometimes come up in Limited, like the Lost in the Woods "combo" in Dark Ascension Limited, or making your own surprising imitation of a Fog deck by just drafting a pile of removal and no good win conditions. It's okay to experiment with deck size, but you should go into it armed with a good understanding of Magic strategy and probability, and the awareness that the overwhelming majority of such experiments are going to fail. In contrast, you pretty much can't go wrong playing exactly 60 cards in your Constructed deck, or 40 cards in your Limited deck. Travis Woo has an interesting article, "90 Card Living End", that has a good explanation of yet another reason to have more than 60 cards: his deck is based on a combo that relies on the card Living End being in his library. Actually drawing Living End is a problem for the deck, so he plays more cards because he doesn't want to draw the most important card. He could play fewer, but he finds that he needs to combo off several times in many games, so he doesn't want to. He can make 90 work because there are good alternatives available for the other cards so he doesn't lose much in quality. Anyway the article has good explanation on this topic. Adding diversity seems to the biggest reason you'd want to go over 60. Since most decks are designed around getting certain cards, increasing the size of the deck beyond sixty decreases the probability of drawing any one card. Since a deck is limited to only four copies of a non land card usually, this added diversity comes at the cost of significantly reducing the chances of getting a certain card in a given game. I think for players looking to experiment, or looking for decks that deliver truly random results, having a deck larger then sixty isn't an issue. Larger decks could be fun for some people to play since they can have a much larger selection of spells, but I don't there are any strategic reasons for doing. Larger decks are going to be much less constant on getting the cards you need, when you need them. Most magic decks are highly focused one or at most two strategies for winning. Especially when your looking for a certain card combination to win, having extra cards will just reduce the odds of you getting the cards you need. A situation in which you would want decks of more than 60 cards is one in which you are playing in a closed ecosystem of decks (this is most likely a causal environment). Smaller deck sizes and more copies of cards lead to better consistency, but this is often antithetical to fun when you play the same decks against each other many times. If you can impose deck building restrictions on all of the decks that will be competing against each other, having a higher minimum deck size can keep these games interesting for longer. Commander is a particularly popular variant of this. One of the big appeals of commander is that because of the larger deck size and inability to run multiple copies of cards, commander games between the same two decks tend to be very different (baring commanders with deck searching abilities). This allows the same few decks to play against each other more times before it gets boring. There's a fringe case for including 61 cards in your deck. That is, if in play testing you find that x number of lands is too few, but x+1 lands is too many, you can effectively play some number between x and x+1 (not exactly x+0.5) lands by playing x+1 lands in a 61 card deck. That is, 20 lands is 0.333 of a 60 card deck, and 21 lands is 0.350. But 21 lands in a 61 card deck is 0.344, a ratio of lands that is impossible with a 60 card deck. Statistically speaking, from the viewpoint of consistency, the only reason to have more than 60 cards is because the strategy or win condition in the deck you're making requires a higher number. 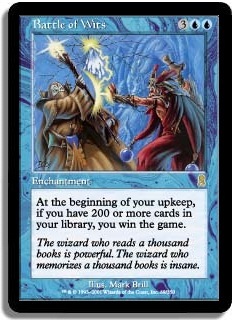 Battle of Wits, as mentioned, is a specific reason to have more than 60 cards, because the alternative win condition requires more than 200 cards. If you are building for the game against a mill deck, you've sacrificed the efficiency of your deck against every other match. Every card you put in the deck is another you have to draw through for the meat of your deck. There should only by the 60 best cards to make your deck work. Why would you play with a larger sized deck? 1- More fun 2- To show those who rely on law of probability that you can throw that out the window when you're dealing with thousands of options(number of existing cards.) It's the exact same science that "proves" that there is no life on other planets. Take a good look at the math for that. Nowhere is there mentioned number of possible planets which, until we know more, is infinite. Every math that I've seen has always ignored other parameters that should be in the equation. The theories for most card mechanics involve 52 different cards(54 if you count the jokers). Even this is sat on it's head by the sheer determination of luck involved. With that in mind, I wouldn't build an aggro deck over 60, or ones that rely on certain combos. You want fewer cards for that and I'd actually prefer fewer cards. If you want to build a defensive deck, then by all means, go over 70 if you want to. Use cards that have more than 1 use. Use card draws. If the others want to stick to 60 out of some fallible math, then by all means, run a milling deck on them until they beg for mercy. In a game that is filled with variety, I cannot understand why players are so stubborn as to not be innovative. Before you quote someone's fallible math, try and prove it wrong. You'll be surprised at the results. Why would one want more than 40 cards in their deck? Where can I find a good source for standard decks in Magic: The Gathering? When should I add cards whose primary feature is drawing more cards to my MTG deck? How Is the Magic Core Set 2015 “Deck Builder's Toolkit” Different From Other Core Set Offerings With Respect To Cards? Where can I buy Magic: The Gathering cards? Are there any turn 1 win decks?